Walking into Sweet Mona’s Chocolate Boutique in Langley opens a visitor to a smorgasbord for the senses. One inhales the lovely chocolate aroma, imagining sweetness melting in your mouth. I knew that. What I didn’t know was the history of this delicious treat that everybody loves. So I asked Mona’s husband, Tony Newbauer, for a tutorial. Chocolate, the fermented, roasted, and ground beans of the Theobroma cacao, can be traced to the Mokaya and other pre-Olmec people in Central America, with the earliest evidence of chocolate beverages dating back to 1900 BC. The Aztecs believed that cacao seeds were the gift of Quetzalcoatl, the God of wisdom, and the seeds had so much value they were used as currency. It was also believed to have aphrodisiac powers and to give the drinker strength. 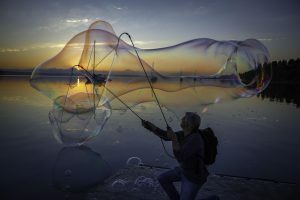 “Spanish explorers in Central and South America brought it back to Spain, but people didn’t like the bitter taste until they tried a concoction made by nuns who sweetened it with honey,” Tony said. Mona Newbauer originally bought chocolate for her confections from France but, after a trip to Ecuador to a chocolate plantation, she decided to switch to “origin” cacao beans from Columbia, the Dominican Republic, Ecuador, Mexico, Papua New Guinea, Peru, Tanzanie, Sao Thomé, and Venezuela. “Chocolate needs a hot, wet climate to grow, so it grows best within 20 degrees north and south of the equator,” she said. “It’s one thing to make candy, but another to see families working together as they have for generations in these cacao groves,” she added. Newbauer started out in the chocolate business 13 years ago, creating truffles for Second Street Bakery in Langley. After the bakery closed, she opened her first shop, Island Angel Chocolates, which eventually morphed into Sweet Mona’s Chocolate Boutique. In 2014, the Newbauers bought and renovated a building in Langley Village. In addition to increased kitchen space, the new shop offers a cozy soda-shop atmosphere where people like to gather. Outside, lovely gardens frame the shop year-round. 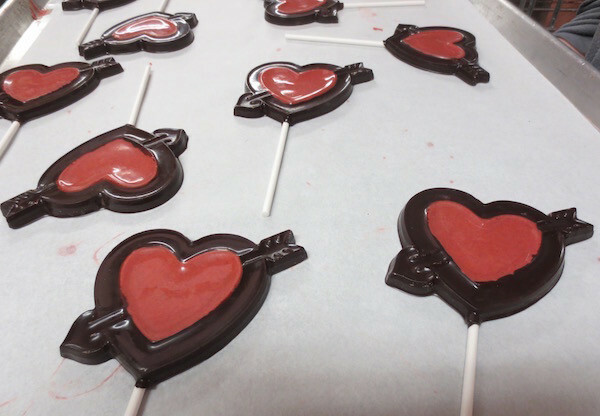 Currently, Newbauer and her staff are preparing for one of the busiest holidays for chocolatiers, Valentine’s Day. 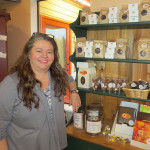 In addition, she is contributing to two chocolate-themed events on Whidbey this month—the Red Wine and Chocolate Tour of local wineries and distilleries and the Coupeville Chocolate Walk. 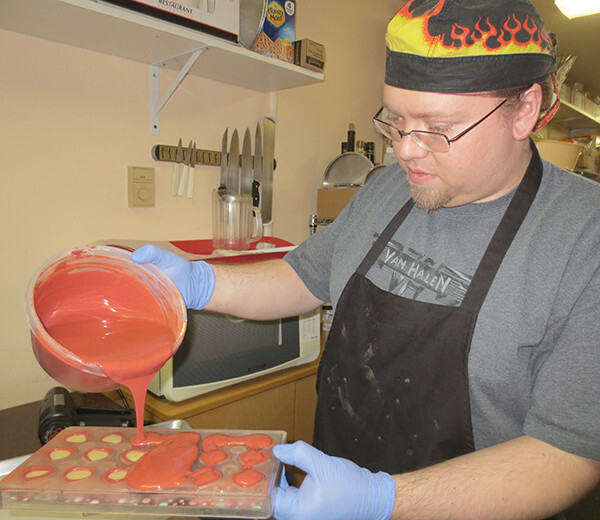 Tristan Stanley, who was personally trained by Newbauer in the art of working with chocolate, can be found backstage in the shop most days, creating confections that tempt the senses—delights like solid chocolate hearts or Newbauer’s signature truffles or salted caramels. For additional information about Sweet Mona, click onto their website here: sweetmonas.com. Betty Freeman is an admitted chocoholic who thinks Mona Newbauer’s salted caramels are indeed the food of the gods. In February, the message of chocolate is clear—chocolate signifies love. 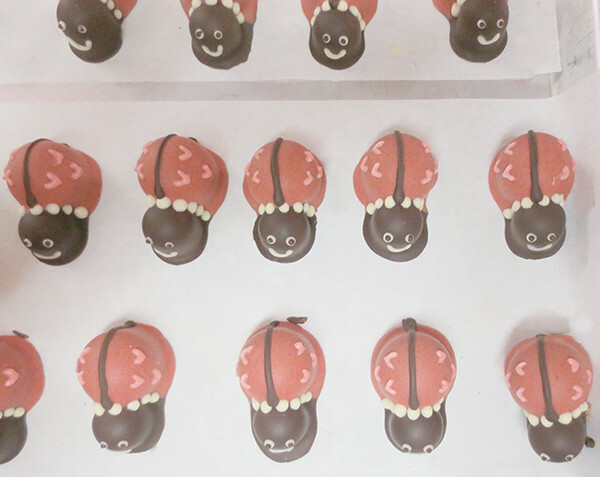 Sweet Mona’s will be creating chocolates for two Whidbey Island events in February. The annual Red Wine & Chocolate Tour continues on Feb. 12-13, at five venues on South Whidbey. Local winemakers and distillers will pour a selection of handcrafted wines and spirits paired with specially selected chocolates, including the loganberry liqueur medallions commissioned from Mona by Whidbey Island Distillery. Tickets for the Red Wine and Chocolate Tour are $20 in advance and can be purchased online at www.brownpapertickets.com/event/2413214. Or get your ticket from the participating venues: Blooms Winery, Holmes Harbor Cellars, Whidbey Island Distillery, Spoiled Dog Winery and Comforts of Whidbey. For more information, visit http://www.whidbeyislandvintners.org. The Coupeville Chamber of Commerce and The Whidbey Examiner invite you to spend Saturday, Feb. 13 from 11 a.m. to 3 p.m. enjoying all the sweet things local merchants have to offer at the first-ever Coupeville Chocolate Walk. 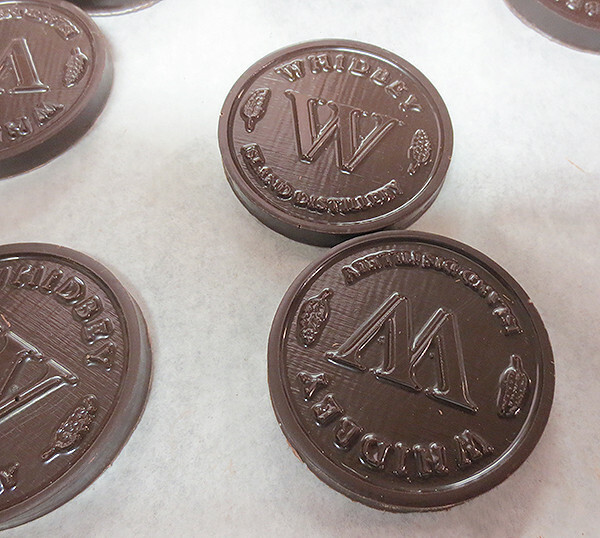 Participating businesses will offer a free chocolate-themed gift, including fine chocolates from Whidbey Island chocolatier Sweet Mona, a chocolate beverage, or other treat.